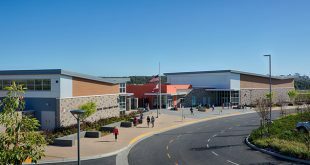 Sage Creek High School received an award from the Concrete Masonry Association of California and Nevada (CMACN) and the American Institute of Architects, California Council’s (AIACC) 2017 Concrete Masonry Design Awards. Sage Creek High School is recognized as a CHPS-Verified School, which stands for the “Collaborative for High Performance Schools.” With an emphasis on environmental learning, this new 56-acre Campus is at the edge of a State preserve, nestled into the hillside for minimal impact to the native terrain. The Campus is organized into four terraces with compact two- and three-story footprints that front a central circulation spine, the Promenade. Student access to the multiple floor levels of each building originates from the Promenade, providing efficient circulation throughout Campus. Public spaces such as the Library, Cafeteria, and Gymnasium engage the Promenade as the Campus social center. 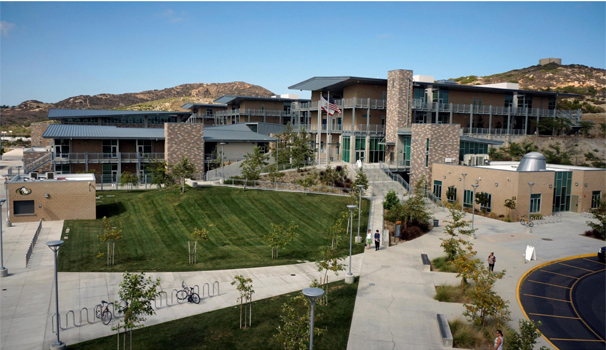 The various sustainable educational elements throughout Campus include: a re-aligned campus bioswale maintaining the original site drainage, the use of native plant material, harvesting rainwater for irrigation, repurposing existing site boulders from site grading, maximizing natural light, and utilizing thermal chimneys for ventilation in the classrooms. 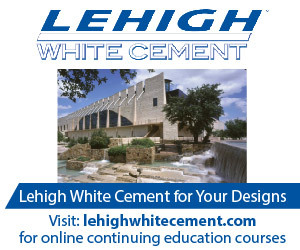 Concrete masonry was selected as a primary building material for its durability, minimal maintenance requirements, and sustainable features including high thermal mass and recycled content. In addition to these robust building attributes, the material was used as a scale element and to provide texture to the overall campus aesthetic. The multi-colored earth tones and patterns of the masonry units reflect the traits of the surrounding site, with the intent of merging and thus complimenting the buildings with the adjacent environment. Furthermore, the exposed concrete masonry at the interior spaces enhances a strong connection between the inside and outside. The school curriculum engages the site hierarchy, placing the academic classrooms at the highest level where expansive views inspire students’ future growth and advancement. The architectural forms suggest a floating airplane wing-like roof and folded profiles to create visual inertia, intended to promote academic success and to optimize student potential.